Tenet Healthcare Corp. expects to sell eight low-margin hospitals and its nine hospitals and clinics in the United Kingdom to reduce debt and focus on healthier operations, outgoing CEO Trevor Fetter said at an analyst conference Wednesday. The facilities, which represent about $1.8 billion in annual revenue, are expected to yield between $900 million and $1 billion in net proceeds and through lease cost reductions, Fetter told the Baird 2017 Global Healthcare Conference. Fetter also noted investors are arguing for or against breaking up Tenet around its three main business lines—hospitals, ambulatory surgery centers and revenue-cycle software—or leaving the company whole except for occasional hospital divestitures. Weighing whether synergies of operating Tenet whole are greater than the breakup value of the company is giving rise to "a lively debate that will and should take place on that question," Fetter said. He made the comments in light of activist investors pressuring the company for turnaround changes led by Glenview Capital Management. The eight additional U.S. hospitals being sold include two in Philadelphia that Tenet announced last week it was selling to Paladin Healthcare for $170 million. Though Fetter previously said Tenet would divest additional hospitals beyond three in Houston recently sold to HCA, this is the first time he has said how many. Fetter announced last week that he is stepping down as Tenet's CEO by March or sooner, depending on when his successor is named. He came under pressure after hedge fund Glenview Capital Management, which owns 18% of Tenet's common shares, resigned board seats to fight for turnaround changes outside of the company. Fetter noted that the hospitals it is selling in Philadelphia—Hahnemann University Hospital and St. Christopher's Hospital for Children—are losing money. And he admitted to Baird analysts that the $100 million Tenet invested in the market for a new hospital tower was a mistake given the way the market changed there in the six years it took from conception to completion. Of the facilities being divested, they have a paltry margin of 4% combined on earnings before interest, taxes, depreciation and amortization. Fetter reiterated that the divestitures would not only raise money to reduce debt, but allow Tenet to focus future capital and management resources in hospital markets where it has first- and second-place market share. Tenet recently finished several big hospital construction projects, including in Detroit and El Paso and San Antonio, Texas. Dallas-based Tenet is the nation's third-largest investor-owned hospital chain with 77 hospitals. Of the $900 million to $1 billion that Tenet hopes to fetch from additional hospital divestitures, about $600 million to $700 million would be from cash proceeds, Fetter said. The company would also benefit from the buyers assuming $280 million in annual leases, Fetter said. Those sales would allow Tenet to reduce its outsized $15 billion debt load to 5.9 times EBITDA vs. the 6.3 times it stands at today. Meantime, Tenet plans to continue using cash to increase its ownership in United Surgical Partners International from 80% today to 95% by mid-2019, Fetter said. USPI, one the nation's largest ambulatory surgery center chains, is growing as insurers shift patients wherever possible from hospital settings to outpatient facilities, Fetter said. Tenet bought a majority stake of USPI in 2015. 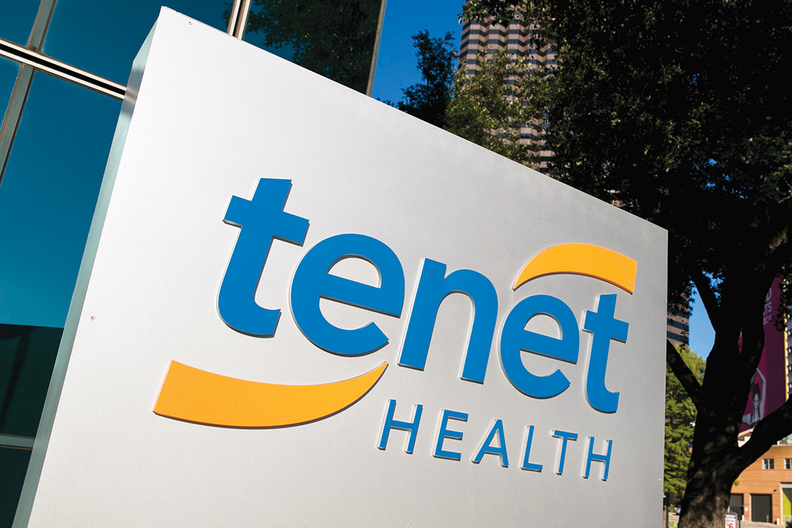 The sum of the three parts of Tenet is worth about $24 per share, Jefferies & Co. healthcare analyst Brian Tanquilut said last week. That's considerably more than the $17.69 closing price of Tenet shares Tuesday. But unlocking that value will be difficult, he said. Mizuho Securities analyst Sheryl Skolnick calls USPI the crown jewel of Tenet. Yet, even if it was sold at a high 12 times USPI's annual earnings before interest, taxes, depreciation and amortization, that would leave about $2 billion for debt reduction. That leaves individual hospital sales—and the hard daily grind of improving hospital operations—as the best way for the next CEO to unlock value for hedge fund Glenview and other investors, she said.